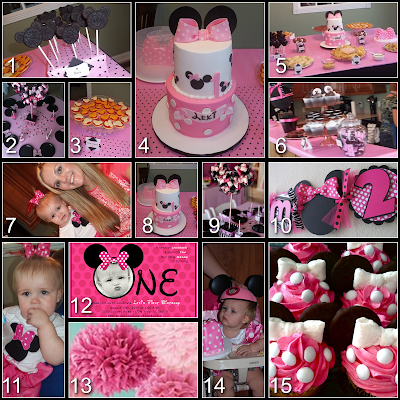 This week we decided to share Lexi's 1st Birthday Party with you. Mickey Mouse Clubhouse is by far Lexi's favorite program on TV, so we thought why not do a Minnie Mouse Clubhouse Theme?! Pinks, Whites, and Blacks were the theme colors that we chose. We had it indoors so we did my favorite thing - pom poms! I also found out it's easier to use napkins than tissue paper, and ends up being cheaper in the long run! As far as treats go, use Mickey Mouse heads everywhere! Lots of Mickey/Minnie silhouettes on the food table, we had Oreos and cheese shaped like our favorite mouse. Lexi had two wardrobe changes for the party - which was a must considering her smash cake got EVERYWHERE! Mickey/Minnie Oreos - so easy to make just use Double Stuff Oreos, and Mini Oreos. Separate the Mini Oreos and tuck on half into the cream of the Double Stuff Oreos where the ears should be. We put ours on lollipop sticks and put them in a rectangle of floral foam wrapped with paper. 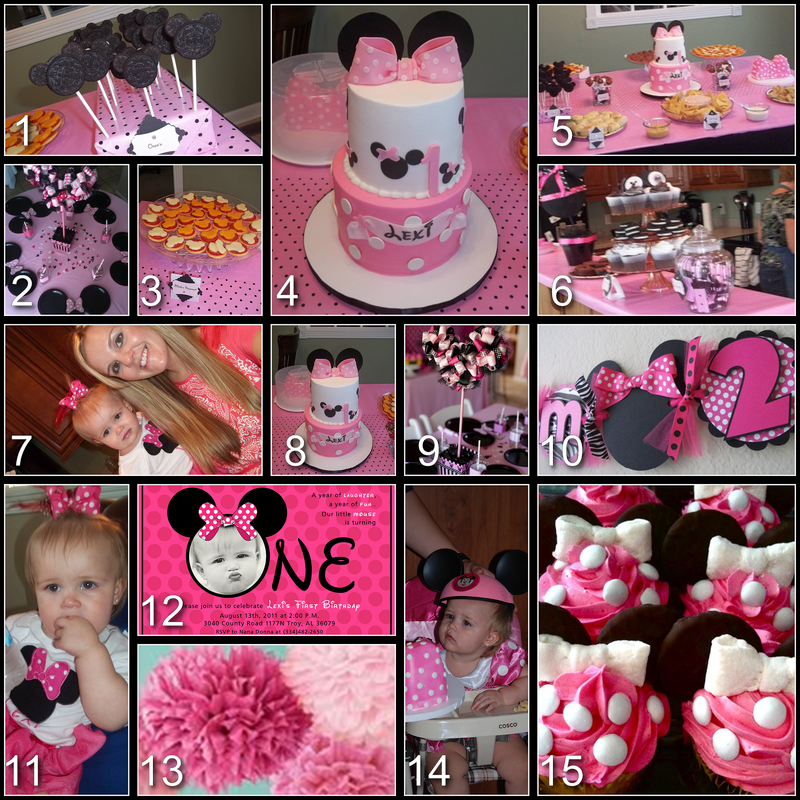 This picture is not from Lexi's party, but we loved the idea of the one large black plate with two smaller ones to form a Minnie silhouette. Mickey cheese & crackers!! Ritz Crackers + Pepperoni + Sargento Mickey shaped cheese = fabulous Mickey appetizers!! I found the Mickey shaped cheese at WalMart. Lexi's wonderful cake by Shelby Cakes!! We are so lucky to have Nikole make such beautiful cakes for us, and they are so delicious too!! Food table - I always cover my kitchen table with wrapping paper then put a fabric skirt around it. Makes for a very easy clean up!! For this party we covered the table in pink wrapping paper and used pink paper with black dots as a table runner down the middle. The bar in my kitchen was covered with wrapping paper as well, we had snack size Hershey bars covered in the same wrapping papers as the table. Cupcakes with toppers I made myself, our Minnie topiary and brownies. Cute Minnie topiary made of styrofoam and ribbon. A cute Minnie banner from Etsy. Lexi in her second outfit, a much needed change after the smash cake! Birthday invitation from Squiggleprints on Etsy. PomPoms made from napkins!! These are not our actual pompoms, but they look very similar. The napkins were easier to work with than the tissue paper and they looked great. Lexi in her Mickey Mouse ears and Minnie Mouse dress (presents from Nana & PawPaw). The ears came from Walt Disney World, and the dress was purchased from the Disney Store. Minnie Mouse cupcakes, again not from our actual party but very cute. When decorating them use white chocolate chips for the dots, just place them in the icing upside down. Quicker and easier than piping them! 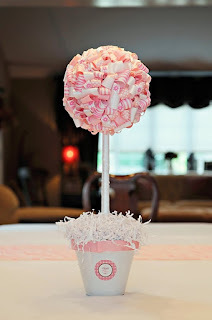 Here is a good tutorial on how to make a ribbon topiary, it is not specifically a Minnie topiary, but you could just add two small styrofoam balls to give you the proper silhouette. Well, you already know that I love this! So cute! Thanks Beth!! We had so much fun, it's great to have them back in the states. I will take better pictures at the next party. Awesome ideas! Beautiful party & beautiful baby! Thanks Amy! My little Lexi is growing up so fast!! She doesn't look much like a baby anymore. Which company did you use on etsy for the banner?! This party was a while ago, here are my favorites on etsy today. Shine, I am doing one right now using a 5" for the head and 2.5" for the ears. Hope that helps! !